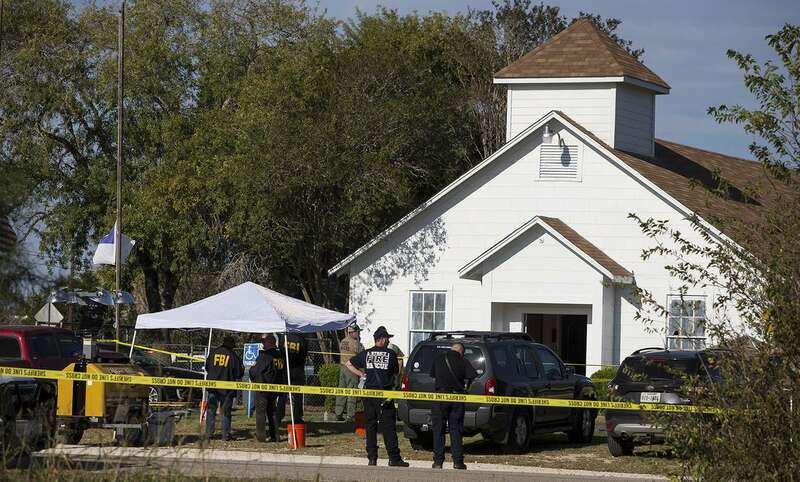 After the killing on Sunday of 26 members of the First Baptist Church in Sutherland Springs in Wilson County, shot dead in the middle of a church service, I am calling a personal moratorium on the issue of solving gun-related terrorism with “thoughts and prayers”. I just don’t think my prayers are working. Obviously, I speak only for myself: merely one small, numb British woman with no right to speak of America’s right to bear arms, or to spoil the fantasy of a thousand gun enthusiasts that in similar circumstances, they would man-up and be that cool-headed gun-toting good guy. But as the First Baptist Church mourns what remains of its congregation after an attacker wearing a bulletproof vest opened fire with a Ruger assault rifle I think I’ve lost faith in all your prayers. Obviously, you keep on tweeting about them. Although, let’s be honest, most of you aren’t literally praying anyway. Most of you are simply pressing retweet on someone else’s flimsy Twitter request for prayers, thinking “Phew, job done”. Or, more accurately, on Sunday night, as the First Baptist news broke, many were retweeting about prayers while thinking “Hang on have they changed the rules on X-Factor?” or “Why has no-one liked my Insta post of a charcoal-dough pizza? WTF? Six likes? Should I take it down?” And none of this, to my mind, is “praying”. In fact, I’d bet that throughout most of Twitter’s biggest thoughts and prayer dispatchers, absolutely zero of the hard-slog, eyes closed, scrunching-of-face,”Oh father, I have prayers” stone cold praying went on. “But Grace,” you might argue, “I communicate with my God/Higher Being without need for traditional, accepted, religious modes or tropes, therefore, I was praying sincerely about Sutherland Springs. As God is all around me, my prayer took the form of gawking at rolling news on Facebook, while bidding on Ebay and bitching on WhatsApp”. This is not enough, I say. To my mind, if you’re bandying about your prayers on social media, I want evidence that for at least one hour after hitting “send’” you were kneeling in a darkened room, in a deep selfess introspective fug, beaming out healing vibes like some sort of holy Daft Punk lazer show. I do not apologise if these strict “Prayer 101” guidelines feel draconian. If Earth is relying mainly on Twitter-based God shout-outs to solve this dichotomy rather than legislation, it’s important we get it right. Let’s hope, for example, Speaker of the United States House of Representatives, Paul Ryan’s thoughts and prayers really totted up some God-points for the future, especially as Sutherland Springs had stopped “Trending” on twitter within a few hours and, as I write this, was already slipping into obscurity. Still, as a childhood communion wafer scoffer and Sunday School pupil who has spent much time fretting about heaven, I must share my concerns over even the most intense, proper, earnest, solemn, eyes-shut praying. I’ll level with you, I just don’t think it works or at least, not like many of you imagine. Even sincere prayer has limited power. Prayer, for centuries, has only ever been a way to make humans beings sit still, take stock of the human condition and hopefully try to do things a bit better. Prayer is not the same as harnessing your own personal X-Man to shine a safety ring around your loved ones. Prayer doesn’t promise a guardian angel who’ll show up when the next Stephen Paddock character sets out to kill 56 and injure 546 on the Las Vegas Strip. Prayer is, instead, a way of thinking things through and coming to conclusions. Prayer is a process of thought that hopefully draws humans to make the right choices. If there is a God, which I hope there is, or, man what a let-down, I think he/she/it would probably want us to think very hard about our human obsession with guns. And re: praying, I think God would hope that we’d be sitting quietly after another mass-shooting and puzzle over why a patch of planet Earth has allotted its resident access to powerful guns and ammunition, yet is in subsequent great pain over the terrible outcomes, while at the same time unable to make any useful changes. If God does exist, I’ll venture that this invisible, omniscient energy probably wants less of Twitter’s thinking and praying on gun sprees and more of the actual doing. Stopping events like Sutherland Springs will require sacrifice, hard work and decisions that will not always be popular. I see a lot of powerful people in the wake of another mass killing yaddering on about their God, but not many are prepared to be godly.